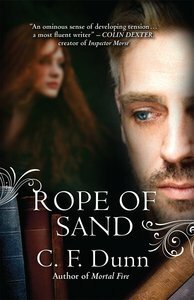 Rope of Sand follows the developing relationship between British historian, Emma D'Eresby and American surgeon, Matthew Lynes. Emma unravels his alarming past, and begins to comprehend how very different her future might be with a man whose identity must never be revealed. Emma nervously meets Matthew's family. She encounters his seventy-year-old son, Henry, and learns how unique the family really is. As Christmas approaches, it is clear that Emma is not welcomed by all: what does Matthew's great-granddaughter, have against her, and what might his sinister psychiatrist granddaughter, Maggie, be prepared to do? Bound by their faith, Matthew and Emma have accepted that they must wait until his wife dies. Very reluctantly, Emma meets Ellen - an elderly woman with a core of steel - and learns how living with Matthew will be mean obfuscation, concealment, and lies. How can the lovers have a life together? About "Rope of Sand (#03 in Secret Of The Journal Series)"